Oxtail stew is on the menu today. This recipe is very special to me, because not only is it overflowing with mouthwatering flavour.......but also because it is packed full of all kinds healthy veggies, and to top it all, it is such a sociable way of cooking. These oxtail cooking recipes must never.... ever be rushed. It takes between 5 to 6 hrs to cook, and this time must be used sitting around the "potjie" with a refreshing drink of your choice and you and your friends solving all the world's problems. See history of the Potjie at the bottom of this recipe. Ingredients for our Oxtail Cooking Recipe from Heaven. Half a cup of flour seasoned with pepper and sea salt. 3 med sized red chillies (optional). 8-10 Baby potatoes washed and not peeled. For those of you on Banting use sweet potato and it will not alter the mouthwatering taste. About 10 bunches mixed herbs tied together for easy removal. half a cup of red wine. 3 med onions halved and sliced. 3 cloves of garlic crushed. Half a teaspoon of crushed ginger. We have used an assortment of our favourite fresh vegetables in this recipe, and as you get better at making your very own oxtail cooking recipes, you can put in whatever tickles your tasebuds. 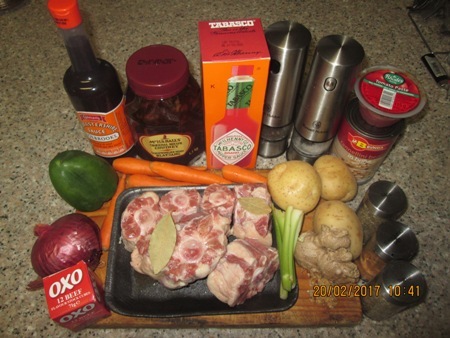 "Time To Start A Cooking"
Because I will be using gas to do this oxtail cooking recipe today, there are certain to be questions about my choice of cooking, and here are some of my reasons for selecting to use gas. It's easy to control the heat. You can (if you have a few extra bucks lying around) buy an adaptor from any hardware store to attach to a normal gas bottle, which will accommodate your cooking pot. Roll the oxtail pieces in the seasoned flour. Put the Olive Oil and butter into the pot, and fry the oxtail pieces for about 3 to 5 minutes (turning them with tongs to get a nice brown color all over. Add the chopped onions, garlic ginger and optional chillies. fry until onions are slightly browned. Return the oxtail to the potjie, and add the wine, beef stock, salt and pepper. Allow to simmer for 5 to 7 minutes. Add your fresh mixed herbs and bay leaves. simmer for a few more minutes and stir gently. Place the lid on, turn the heat down until the food is just gently bubbling. Leave to bubble for about 2½ hours. Remove lid using oven gloves, as this is gonna be cooking hot. Give a gentle stir to make sure it is not sticking to the pot. Add the remainder of the ingredients, replace the lid and cook for a further 2 hours. Do not sneak a peek at any stage, just enjoy the company and the refreshments of your choice. After about 4½ hours ,take off the lid (remember to use your gloves) and test to see if the oxtail is starting to come loose from the bone. If not, close the lid and continue cooking until it does. When the oxtail is really tender, using a spoon taste the gravy and if required add salt and pepper to taste, then stir carefully. Replace lid turn off the gas and have some more refreshments if required.. whilst solving all the rest of the problems of this world. 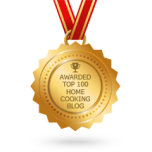 There are oh so many different ways for one to plate our delicious oxtail cooking recipes and as you know we try to keep things simple on this site, so here are a few of our plain popular ideas to serve this dish with. Traditional brown or white rice, my Lynnie loves it with yellow rice. 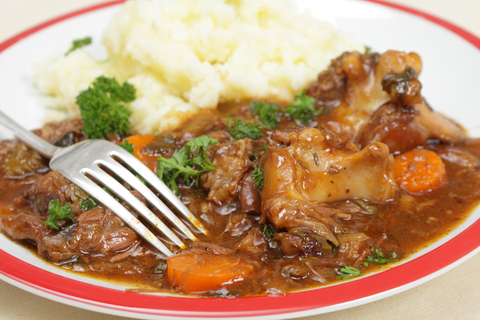 For those of you who are preparing banting oxtail stew, you can use cauliflower mash, which is hugely popular at the moment. It tastes just as delicious with any pasta. 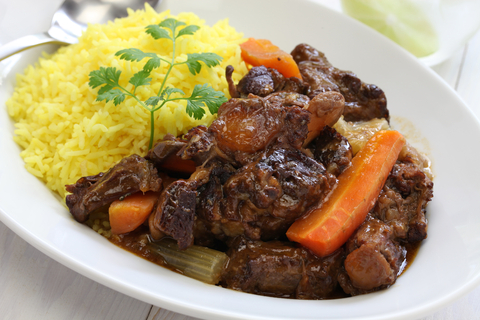 In certain parts of Africa especially, the Oxtail is enjoyed with traditional mielie pap. And can even be served with a loaf of fresh bread or rolls. We hope you have enjoyed cooking this meal with us today and as always, till we meet again in the Home Cooking Haven's kitchen.........Happy Cooking!! In the early 18 hundreds the Irish used a cast iron pot hung over an open flame by a chain for cooking and used to shorten or lengthen the chain to adjust the heat temp. The potjie pot however dates back to the iron age when man learned to cast iron into vessels of different shapes for a variety of purposes. The pots during this time also developed a lot of mystery due to the fact that they were very popular amongst the witches and druids of the time, who used the pots for their rituals and ceremonies." "Among the African tribal cultures these pots became known as “Putu” pots (corn meal pots). As a result, the potjie is used extensively in Africa today by almost all cultures, and has survived the test of time." "Potjiekos is robust, full of flavours, very healthy, but it is also a friendly and very sociable occasion. Not only is potjiekos healthy food, but it is also healthy in that it causes one to relax, be happy and enjoy good company. Potjiekos is an experience all on its own!! 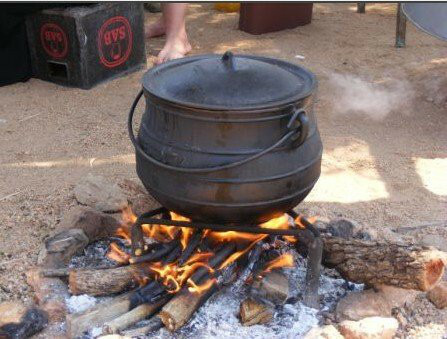 - Potjiekos is really a group of good friends, a well seasoned potjie, good beer or a fine wine, a warm fire, lots of time, fine food, tall stories and delectable aromas." "The pores in the cast iron capture flavours of past potjiekos, which gradually get released into the potjie as the metal heats up. Most potjiekos taste better the next day after having “aged” overnight in the pot"